These resources are available only to current Rivier Students, Faculty & Staff. 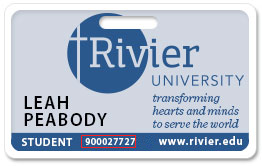 Locate your identification number on the front of your Rivier ID card and enter the last nine digits in the box below, including all leading zeros. If your ID # is longer than nine digits, only enter the last nine digits. Do not enter any letters. If you do not have an ID card, your student ID # can be found on your bill, your schedule, or in MyRiv. If using your ID # from MyRiv, only include the 3rd through the 11th digits, Ignore A and the leading 0 as well as any digits at the end. If your student ID # is not recognized, call 603-897-8256 and ask to speak with a reference librarian or email Ask-a-Librarian.